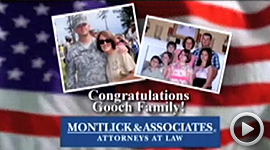 The Gooch family has won a trip to Orlando, Florida from Montlick & Associates! 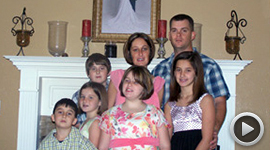 The family was named a Deserving Military Family after telling us their story. Sgt. Jesse Gooch is currently on tour in Afghanistan with HHC 2-121. 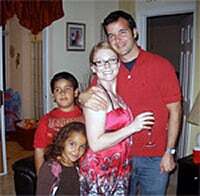 He and his wife Melena have 5 children, ages 7 to 16. Melena is raising the children while her husband is deployed PLUS she is the chair of the Family Readiness Group. As chair of FRG, Melena stands ready to assist and take care of any and all families of those who are deployed; all this while taking care of her children, one of which is legally blind. WSB-TV selected the 5 finalists from entries submitted and then the public voted for the winner on wsbtv.com. Montlick & Associates is happy to provide the Gooch Family with a much-deserved paid vacation to Disney World in Orlando, Florida! their stories and photos with us. You are truly remarkable families. You are all American heroes! All the nominees were well-deserving, and we appreciate the time they took to enter our contest! 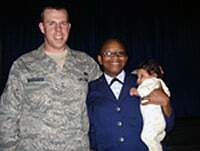 A1C Ashley T. Clay serves in the United States Air Force. She is a mother of a 2 year old little boy and is serving very proudly. 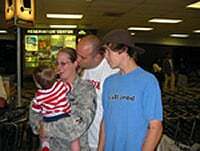 Her son was born August 8, 2007, and Ashley was called to serve in Afghanistan that December, missing her son’s first Christmas. Ashley served successfully and returned home safely. Still on active duty, she is scheduled to return to Afghanistan this October, missing yet another Christmas with her family. Sgt. Corey McGee; U.S. Army Ranger for the 10th Mountain Division in Fort Drum was nominated for the Bronze Star and received two Purple Hearts and the Army Commendation with Valor. Sgt. McGee was critically injured while on a mission to help a convoy that was hit very badly by enemy combatants. He went into a coma after saving four lives that day, only to wake up one week later as a quadriplegic. He was told he would never walk again after that; but a year later after many surgeries he walks proudly. Sgt. McGee currently works at the Department of Veterans Affairs helping other veterans like himself. 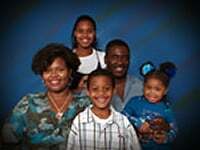 The McKenzie family has never had a honeymoon or had much time for family vacations. Sergeant Reginald McKenzie has been deployed four times in the last seven years for 3 to 12 months at a time. Mrs. McKenzie serves as Family Readiness Group (FRG) Leader in support of 160 families in her husband’s troop and is also a PTA leader, MOP and works to support their child with special needs. 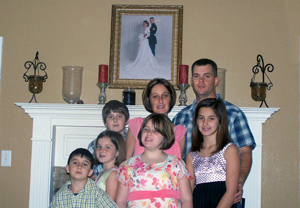 Still this close knit family of five cherishes the time they have together and are proud to serve our great country! SSgt Brandy Newbauer and SSgt Paul Newbauer met in 2005 and were married in December 2006, just two months before they each left for separate Air Force deployments. They recently had a baby girl named Jaylah who is currently 4 months old. Paul is currently at training for a month before he deploys for six months in August. Brandy is a full time military NCO. Despite frequent separations and deployments, they still manage to stay strong and have a happy, loving family.